November 30, 2016 - "Company News"
Separation technology provider Eriez is expanding its foothold in the UK with an investment of $425,000 in a new rotor manufacturing facility in South Wales, an expansion of its European manufacturing headquarters there. The decision was made “following a prolonged upturn in sales,” the company said. The South Wales facility will be Eriez’s third rotor manufacturing site globally and compliments Eddy Current manufacturing sites in North America and Asia. Eriez-Europe said it will manufacture and stock a number of Eddy Current Separator rotors at the site, providing greater access to process-critical spare rotors for clients. 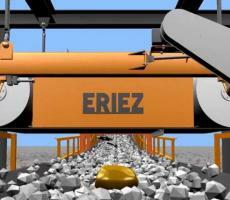 The investment includes the purchase of a high-speed balancing machine and a filament widening machine for the production of Eriez’s range of Eddy Current Separators, which recover nonferrous metals from a range of waste streams. Eriez said it plans to increase production capacity at the South Wales site by one third per year while working to promote global growth of the Eriez brand and providing service to new users and customers. The Erie, PA-based company is a leader in separation technology and its products are used in a variety of industries from metalworking to textiles.